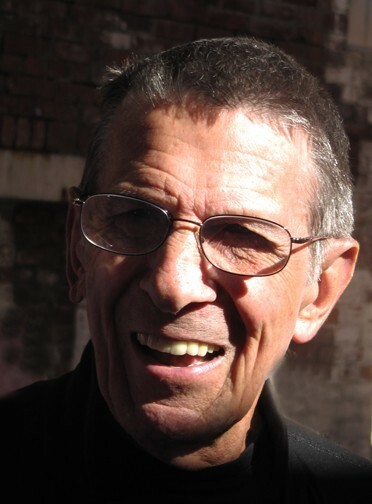 Leonard Nimoy will speak at Mass MoCA on October 21. Giuliano photo. Photographer Leonard Nimoy, whose exhibition Secret Selves is on display through January 2, 2011, at MASS MoCA (Massachusetts Museum of Contemporary Art) will offer insight into his creative and technical process during a talk at the museum on Thursday, October 21, at 5 PM. Tickets for the talk are $6; students are admitted for free. Inspired by Aristophanes' theory that humans were once double-sided creatures with two heads and multiple limbs before Zeus cleaved man in two and left him forever struggling to be whole again. Nimoy strives to reveal his subjects' other half in Secret Selves. Shot in nearby Northampton, Massachusetts, in 2007, the series is exhibited for the first time at MASS MoCA. Secret Selves presents a compelling perspective on the structure of identity as well as an intimate look at the relationship between portrait subject and photographer. The installation at MASS MoCA includes a video of the studio sessions in Northampton, during which Nimoy and his subjects meet, discuss, and negotiate the portraits in quick and sometimes remarkably revealing exchanges. Nimoy began his photography career as a teenager, setting up a darkroom in the family's bathroom. In recent years he has undertaken several groundbreaking photographic series and published two books: The Full Body Project, showing a group of large women in various poses taken from famous paintings or photographs, and Shekhina which invokes sexuality, religiosity, and Jewish mysticism. Other photo series include: The Egg, Hand, and Black and White comprising female nudes meant to evoke sculpture. Born in Boston, Leonard Nimoy has worked in feature films, television, and theater, appearing in many well-known TV series and several feature films. However, it was Nimoy's success as Mr. Spock in the science fiction television series, Star Trek, which gained him worldwide recognition. Throughout his life Nimoy has been engaged with photography as both student and practitioner. In the 1970s he studied under the influential photographer Robert Heinecken at UCLA. In 1973 Nimoy had his first show at a gallery. That same year his book of poems and photographs, You and I, was published, and by 1977 he had recorded for the Dot Label and earned a Masters Degree in Education. In 2000 he was an artist-in-residence at the American Academy in Rome. In September of that year he was awarded an Honorary Doctorate of Humane Letters from Antioch University for his work in Holocaust remembrance, the arts and the environment. Nimoy and his wife, Susan Bay Nimoy, have contributed toward a variety of causes including the renovation and expansion of Griffith Observatory in Los Angeles and the Thalia Theatre in New York City. A new lecture hall at the observatory, the Leonard Nimoy Event Horizon, has been named in his honor, and the theatre in New York is now named The Leonard Nimoy Thalia. Nimoy is the holder of four Honorary Doctorates and two Masters degrees.